I read a lot of puns, recently. They were so funny I thought I might like to share them with you. Here are the top ten funniest and hilarious puns I have picked for you. 1. The roundest knight at King Arthur’s table was Sir Cumference. He acquired his size from too much pi. 2. Did you hear about the guy whose whole left side was cut off? He’s all right now. 3. The dog gave birth to puppies near the road and was cited for littering. 4. Let’s talk about rights and lefts. You’re right, so I left. 5. When William joined the army, he disliked the phrase ‘fire at will’. 8. The man who survived mustard gas and pepper spray is now a seasoned veteran. 9. He drove his expensive car into a tree and found out how the Mercedes bends. 10. A rubber band pistol was confiscated from algebra class because it was a weapon of math disruption. Bonus: Another 10 Funny Puns! Update: Since I found out that this is one of the most visited blog posts on this blog, I’ve decided to post 10 more great puns for you! I hope you’ll enjoy them! 1. If you want to make money as a comedian you gotta have the cents of humor. 2. What do you call a marketplace that sells weird stuff? A bizarre bazaar! 3. Being struck by lightning is a really shocking experience! 4. The Hungary Wales Seattled down and Finnished their lunch, Hamburg-ers with Chiles. 5. A bicycle cannot stand on its own because it is two-tired. 7. How do celebrities stay cool? They have many fans! 9. 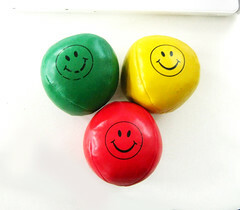 The reason he didn’t become a juggler was… he hadn’t got the balls to do it! I love puns! If you know any more funny puns, please feel free to leave one in the comments section below. I’ll feature some good ones here! I hope you’ve enjoyed those 10 funny puns above! If you did, then perhaps you might like to get my book, Creative & Funny Poetry for Kids, which I wrote when I was 9 years old. Now I’m 12. 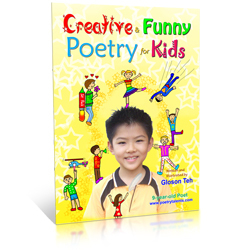 It contains 20 creative funny poems accompanied with colorful illustrations to make you and your kids laugh and giggle! Please click the book below for more details. If you have been around Gloson Blog for a week or two, you might notice that I haven’t posted in about 11 days (I usually post once in 3 days). I have a couple of reasons why I haven’t posted, and here they are. I’ve been remodeling Poetry Talents, my poetry website where I can post my poems. I gave it new look. I used wordpress (I used wordpress to make a website! Cool!). I won’t post my poems on Gloson Blog anymore, but I’ll post it on Poetry Talents instead. I joined the handball team in my school. We practiced really hard, and we’re going to compete on Tuesday, 14 April 2009. So, I got really tired. Sometimes, we even played on evenings. I also worked on projects relating to my upcoming poetry book. I planned to add a little more color to the background of my poetry book front cover. I went to Smart Kids, the Largest Education Fair in Malaysia. It is an exhibition, where companies purchase booths to promote their products there. It lasted for 3 days (10-12 April 2009). It was very interesting and I look forward to attending it next year. I joined its “Who You Want to Be” competition on Sunday (I practiced on Saturday), and ended up with a constellation prize. I want to provide you with quality content, not short posts that have little quality. So, it might take some time to write a post. Well, those are the reasons why I haven’t been posting regularly. I hope you will forgive me. Because I am not very busy anymore, I look forward to posting quality content for you soon! Update (18 April 2009): Sorry, I am still busy with my poetry book illustrations, making big improvements. I hope I will finish them soon! I ran a survey for Gloson Blog last month, asking what posts my readers like the best, all the howtos and tips, the blogging tips, the reviews on useful tools, or my funny poems. Most of them answered ‘All the howtos and tips’. But, another number of them answered ‘My funny poems’. I don’t post my funny poems here, on Gloson Blog, frequently because this blog is not meant to be full of poems. It is supposed to be anything interesting that I learn. Recently, I decided to remodel PoetryTalents.com so that the people who loves to read my poetry can go there and read them (That was why I didn’t post here, recently). I won’t post my poems on Gloson Blog anymore. Instead, I’ll post them on Poetry Talents. So, please go there to read them. PoetryTalents.com has been dominant for a long time (P.S. If you want to see the old PoetryTalents.com, click here). I created it using a web creator software. I didn’t update it for about…more than 6 months. Make a new page in which I will post the poem. Link to the poem from the ‘Funny Poetry’ page. Wait for it to finish (Sometimes this takes a long time). After I had more experience in blogging, I realized that wordpress can create sites! No need expensive web creator software. Plus, it is easier! All I need to do is to ‘steal’ the code from the already coded code in any theme (/wp-admin/theme-editor.php). For example, look at the homepage of PoetryTalents.com. It’s a list of the 10 recent poems. When I post a new poem, it automatically puts the newest poem at the top of the list, and removes the last poem. Well, how did I get the code? Look at Gloson Blog’s footer…see the recent posts list? Yeah, that’s where I got the code. Hit ‘Publish’ (It takes a short while). Maybe, I’ll write a post on how to create a website by just using wordpress, or how I remodeled Poetry Talents, soon. And as for the poems that are on Gloson Blog, I deleted some of them and redirected the URL to the same poem on Poetry Talents with a plugin called ‘Redirection’. I will post poems more frequently there because…That site is meant for poetry! I also installed a rating plugin that lets you rate my poems (1-5 stars). The best 20 poems (The ones with the highest rating) will be displayed at the sidebar. So, please help me to rate the poems . It will help my Poetry Talents readers find the best poems to read. Maybe, besides poems, I’ll post tips on how to write funny poetry, or site news. Maybe, I’ll also start a forum where you can discuss stuff, or post your funny poems there (The best ones would be posted). So, instead of being a guest blogger, you become a guest poet . To read my poems, please head to Poetry Talents. I hope you’ll enjoy them. P.S. And don’t forget to rate them!